HUGE fans which can whip up a 65-mile gale that will act as a brake on landing airplanes will be the next piece of equipment installed in the modern airport, according to experimenters. 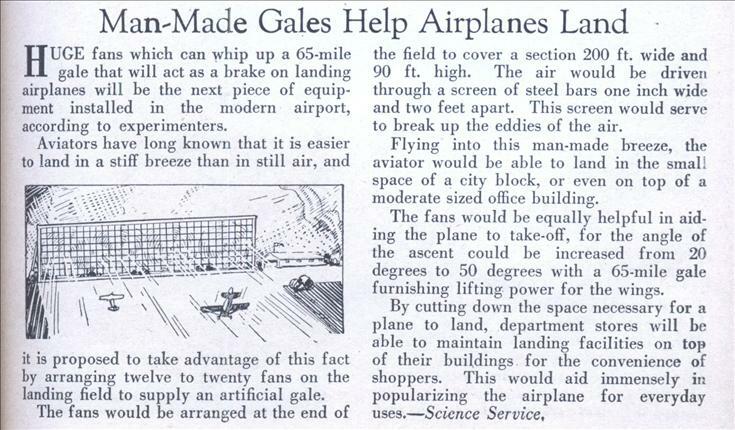 Aviators have long known that it is easier to land in a stiff breeze than in still air, and it is proposed to take advantage of this fact by arranging twelve to twenty fans on the landing field to supply an artificial gale. The fans would be arranged at the end of the field to cover a section 200 ft. wide and 90 ft. high. The air would be driven through a screen of steel bars one inch wide and two feet apart. This screen would serve to break up the eddies of the air. Flying into this man-made breeze, the aviator would be able to land in the small space of a city block, or even on top of a moderate sized office building. 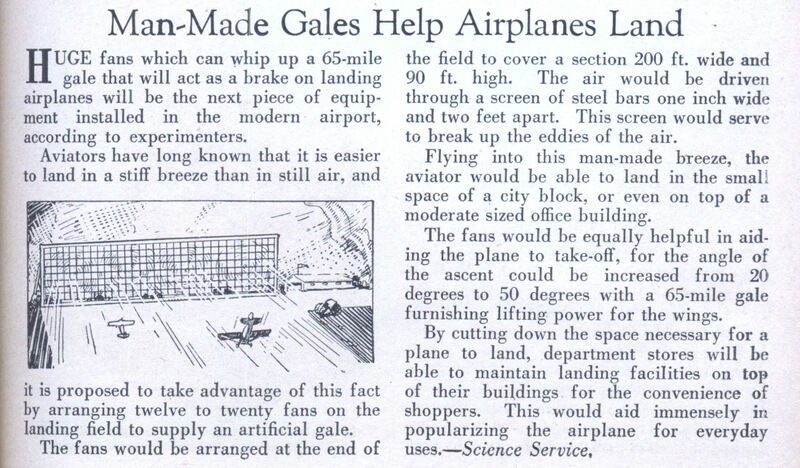 The fans would be equally helpful in aiding the plane to take-off, for the angle of the ascent could be increased from 20 degrees to 50 degrees with a 65-mile gale furnishing lifting power for the wings. I get a kick out of the angle of attack of the landing airplane. Landing into a wind that gets faster (as you get closer to the source) while you are slowing down is going to be intereting. You would see airplanes flying backwards. 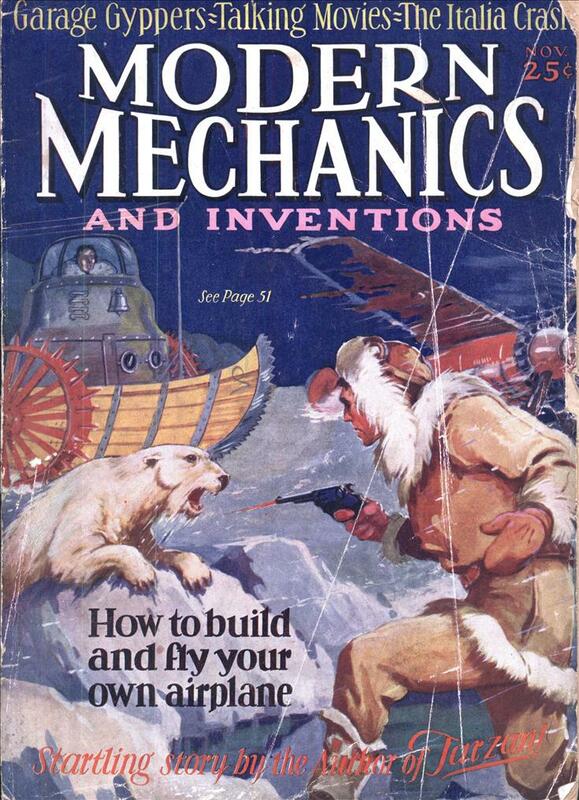 I did that with a radio controlled plane once in a strong wind, I might not try it for real. I would also be a little concerned with taking off at a 50 degree climb based on artificial wind that is going to peter out in two seconds. Stalling a plane near the ground or a building can be bad. You know, you can make a system foolproof, but you cannot make it proof against fools. Runways have overshoots. What does this have, for the pilot coming in too fast? High-speed rotating blades, electrical current (just the thing for igniting ruptured avgas!) and beyond, the street full of passers-by below.